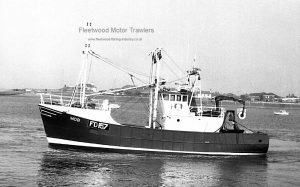 3.7.1954: Launched by Richards Ironworks Ltd, Lowestoft (Yd.No.421) for Pegasus Trawling Co Ltd, Fleetwood part of the Boston Group. Arthur W. Suddaby, Lowestoft, manager. Registered at Lowestoft (LT58). 1971: Sold to Layhill Chartering Ltd, 34 Crutched Friars, London, EC3. Renamed PENZANCE PEGASUS. Lowestoft registry closed. Registered at Penzance (PZ375). 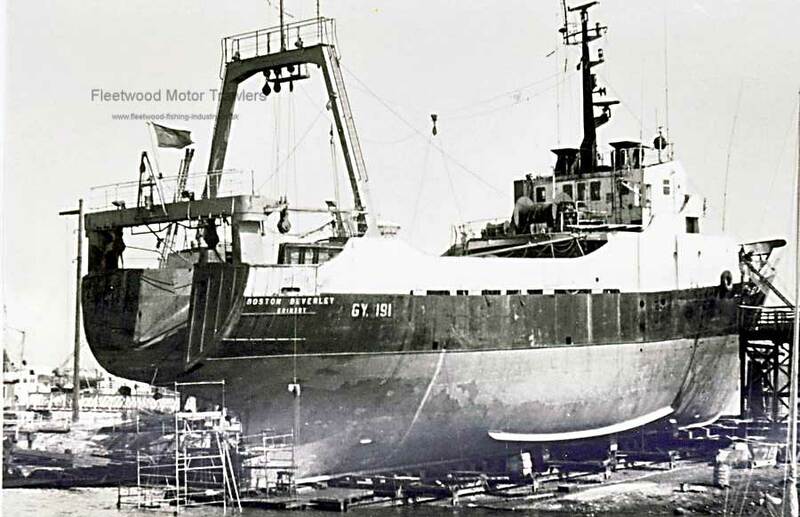 1974: Sold to Safetyships Ltd, Aberdeen (John Brown & Sons (Aberdeen) Ltd, managers. Renamed KILSYTH. December 1976: Sold to M. Nichols, Middlesbrough for demolition. 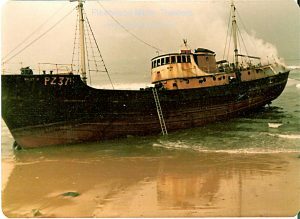 13th January 1977: Drove ashore at Whitley Bay after breaking adrift from tug NIPAROUND towing her from Aberdeen to Tees. 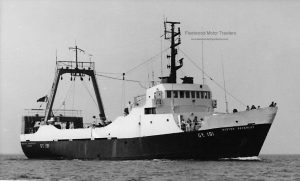 When fishing in the region of Botney Gap, about 90 miles northeast of Lowestoft, the vessel trawled up a live depth charge. The corroded depth charge came onto the deck when the cod end was unfastened. It was heaved over the side by the crew, but as it sank a ship’s length away it exploded. 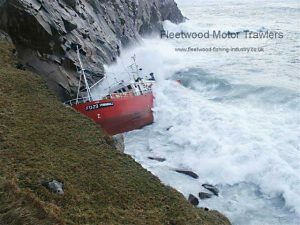 The crew and the trawler were badly shaken and the compass was thrown out of its gimbal rings. Food was also thrown out of the pantry. The skipper said that on inspection there was no damage apart from electrical trouble in the engine room. 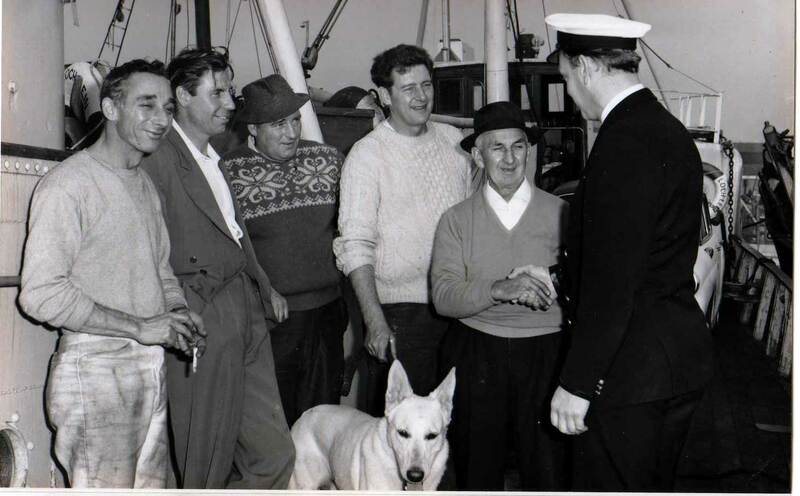 He stated that the probability was that when the depth charge was dropped in the water originally it had failed to go off and that the thump on the deck of the Boston Pegasus has made it ‘live’ again. On her return the vessel was slipped for a thorough examination. 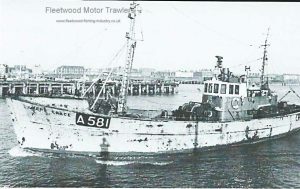 Believed working from Fleetwood Between 14/01/57 and 01/08/59. 03/11/2016: Page re-published due to site problems. This entry was posted in Lost, Motor Trawler, Pegasus Trawling and tagged Pegasus Trawling on 3rd November 2016 by Howard Small. 3.1959: Launched by George Thompson & Son Ltd, Buckie for Frank Pitts, Kirkella & others as STAR OF FREEDOM. 1959: Completed. Registered at Hull (H131). 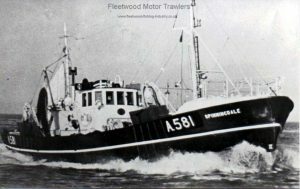 By 1964: Owned by John Davies & Clifford Davies, Fleetwood. Hull registry closed Registered at Fleetwood (FD215). 08.1967: On a trip to the Southern Minches (Sk. Harold Harrison). Landed 500 st. fish and anchored for a few hours rest. 06:40 restarted fishing and crew were on deck shooting when they smelled smoke. Flames coming from cabin. Automatic extinguishers were switched on in the engine room but these did not cover the cabin. Engineer Woodward Millington attempted to get to the cabin but was unable to do so. Crew abandoned and fuel tanks exploded. 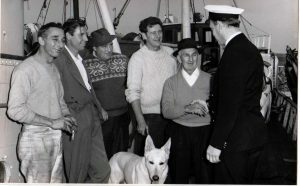 It was the second occasion that a cabin fire had occurred on the vessel. Castlebay lifeboat rescued the crew. 30/10/2016: Page re-published due to site problems. This entry was posted in Inshore Fishing Vessels, Lost on 29th October 2016 by Howard Small. 01/1904: Completed at Robert Lathom & Co., of Crossens, Southport as WILD CHERRY for John Jones, Dee View Road, Connah’s Quay. 20/03/1906: Registered by owner at Chester (CH7). 25/01/1910: Sold to new owner and re-registered at Ramsey IOM as (RY24). 30/12/1918: Sold to Arthur Walker, Oaklea, Whitehaven and worked by Thomas Tubman. 08/11/1921: Reported as fitted with an engine. 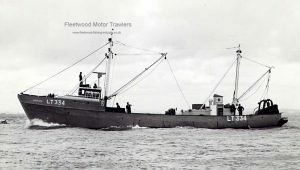 21/02/1922: Sold to Herbert Wilson Walker, Lingmell, Seascale and registered at Whitehaven (WA22). 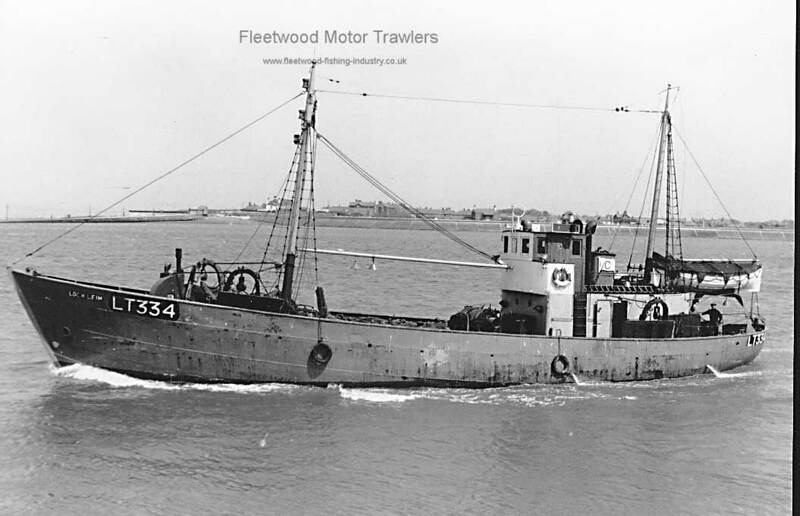 28/11/1923: Sold to Charles Schofield, 72 Adelaide Street, Fleetwood and registered at Fleetwood (FD429). 05/01/1940: Sold to William Schofield, Crown Hotel Fleetwood. 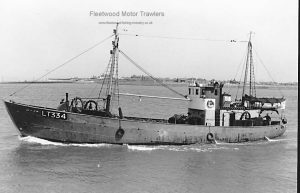 13/08/1940: Sold to Robert Anderson Blackledge, Hatfield Avenue, Fleetwood. 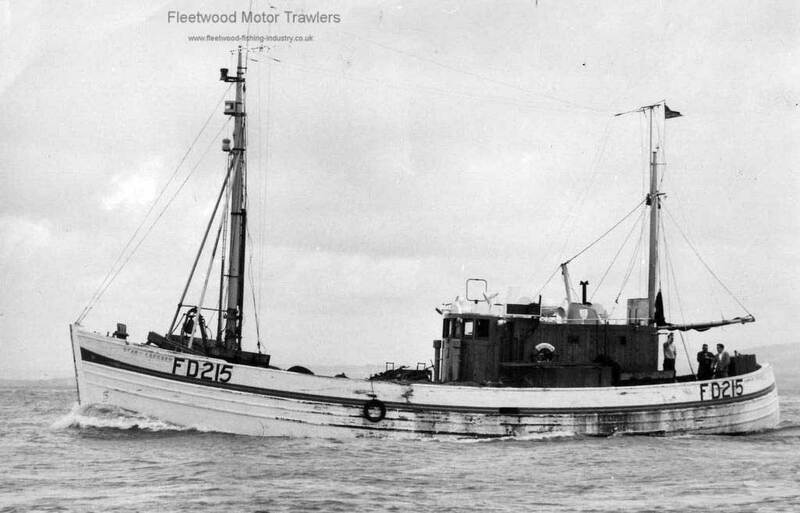 25/04/1945: Sold to Vernon Cowpe, 81 Bold Street, Fleetwood and worked by Fred Price. 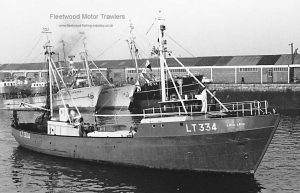 13/11/1946: Sold to Herbert Rawcliffe, 39 Poulton Road, Fleetwood. 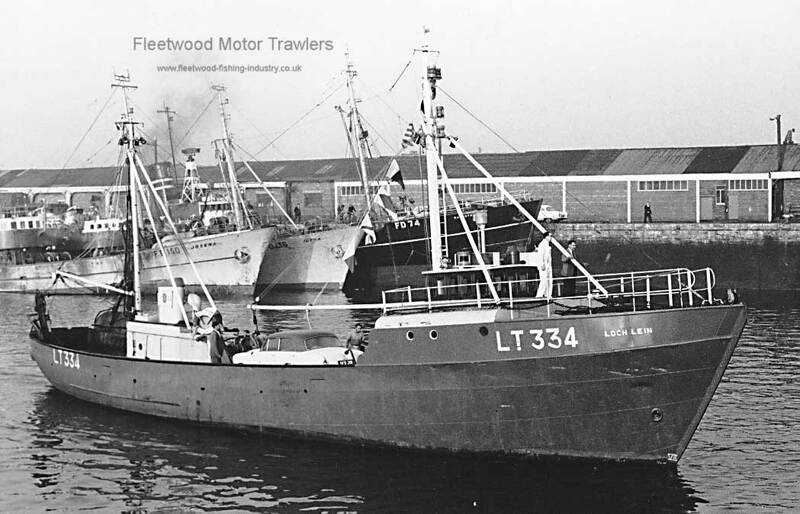 19/5/1954: Sold to Ernest Wilson, 43 Poulton Road, Fleetwood. 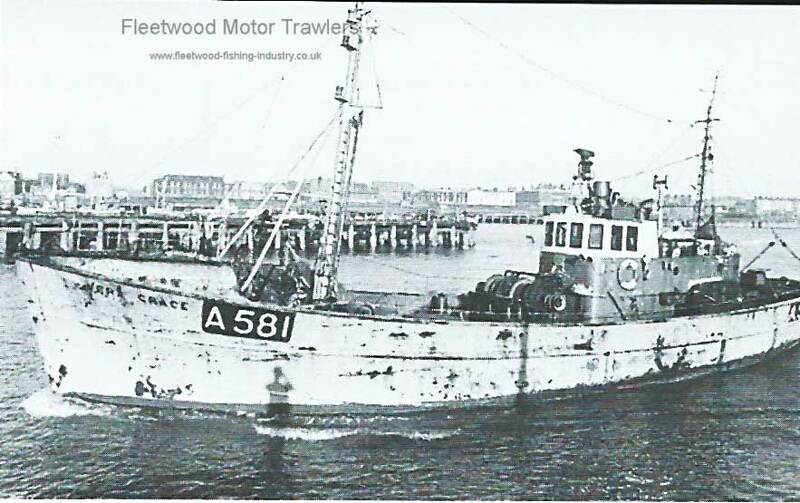 14/6/1955: Sold to Willie Wilkinson, Lytham St Annes who laid her up in Allanson’s boatyard, Freckleton. 19/05/1959: Sold to for £90 to John Coulton, Long Lane, Banks, Southport and re-registered at Preston (PN34). 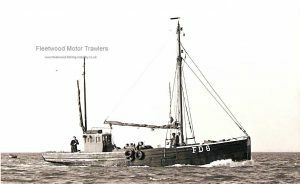 1959-60: Rebuilt including new decks, new wheelhouse, new upper stem, and rewiring at Crossens Sluice plus a Fowler diesel 1:1 gearbox fitted. 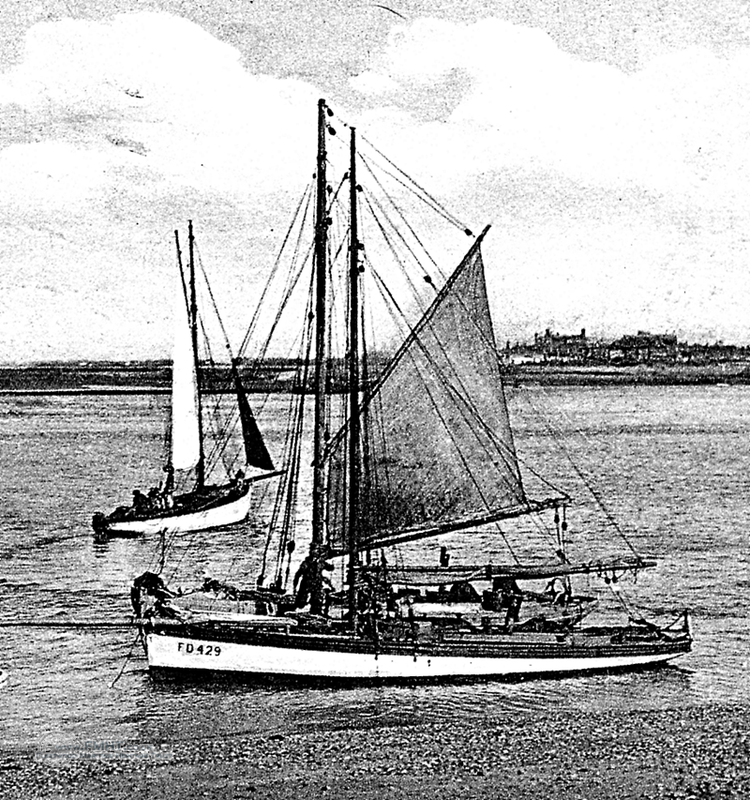 On completion the boat was moored at Southport and Hesketh Bank and fished with Peter Rimmer of Marshside. 08/08/1962: Sold to FW Coward, Fernyhalgh Lane, Fulwood, Preston for £500. 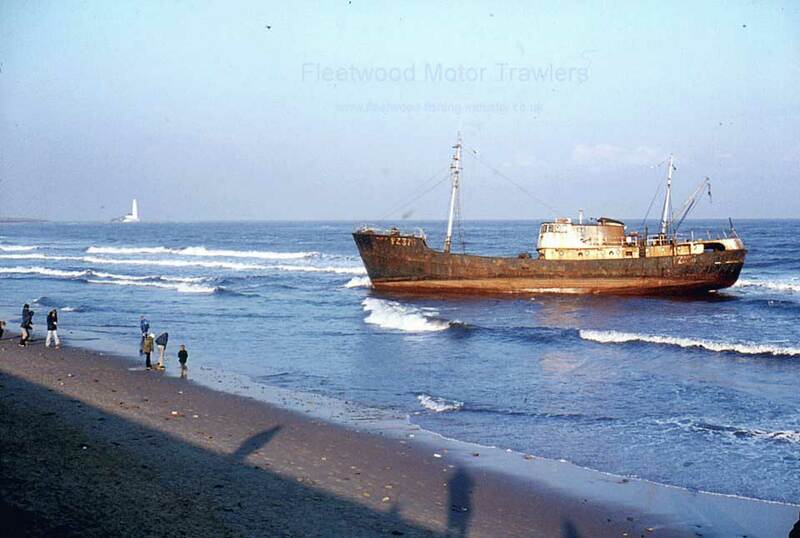 09/07/1969: Sold to Arthur Mervyn Filton, Burnley, worked in 1971 by FW Groden, of Fleetwood. 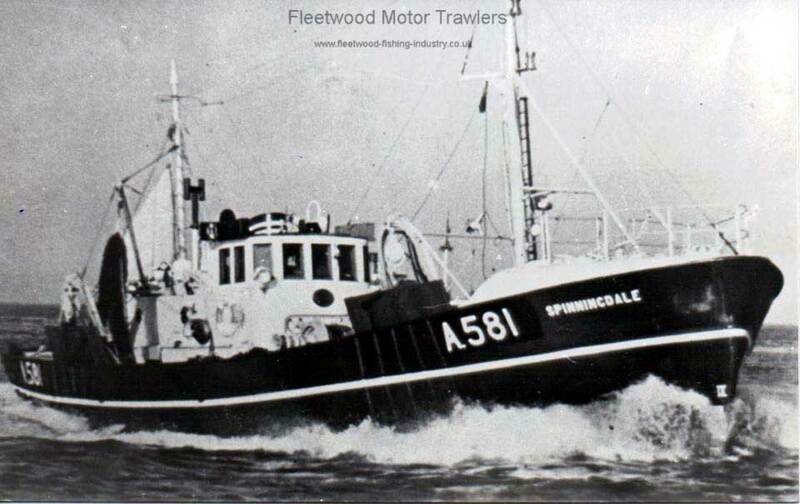 24/06/1971: Received assistance from the Lytham St Annes Lifeboat SARAH TOWNSEND PORRITT. 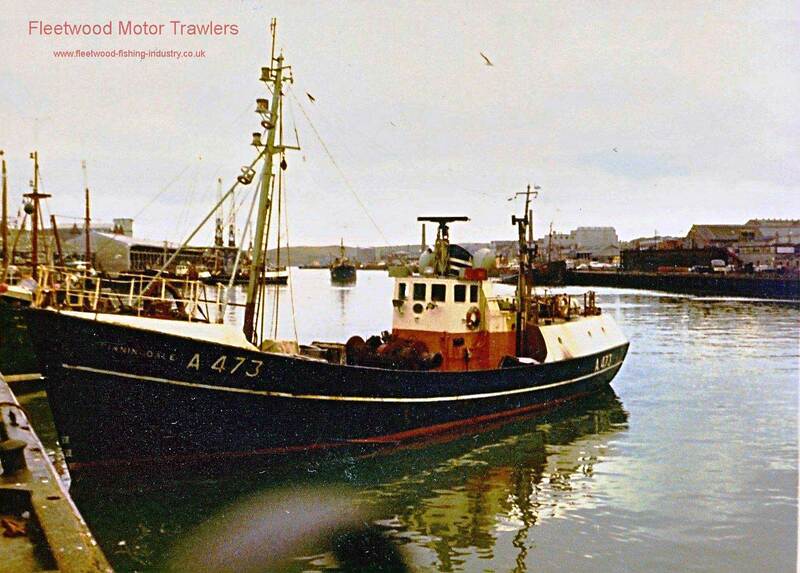 01/11/1973: Sold to Tom Gorew and Preston fishing registry closed. 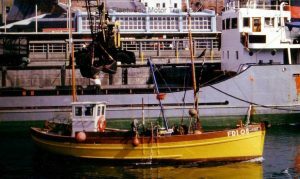 27/07/1981: Returned to fishing under ownership of Michael Stephens of Rochdale. 27/07/1986: sold to K Lyne, Ashton under Lyne. 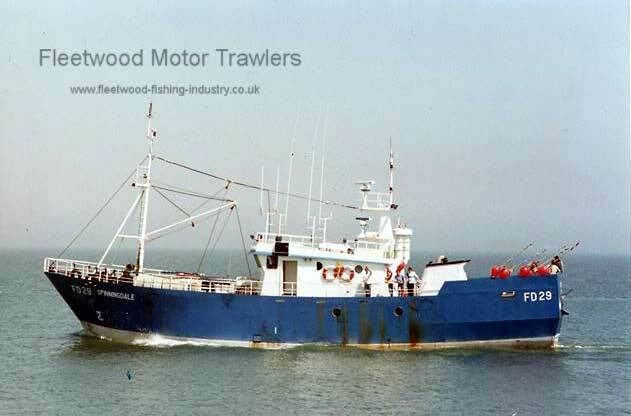 17/11/1988: Fishing registration removed under Merchant Shipping Act 1988. 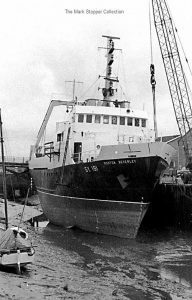 1994: Rebuilt at Liverpool Marina by Jim Weir who sold her to new owners in Fiddlers Ferry. 12/1998: Parted moorings off Rock Ferry in the River Mersey and struck Rock Ferry Pier losing her lower stem, breaking the keel and capsizing. 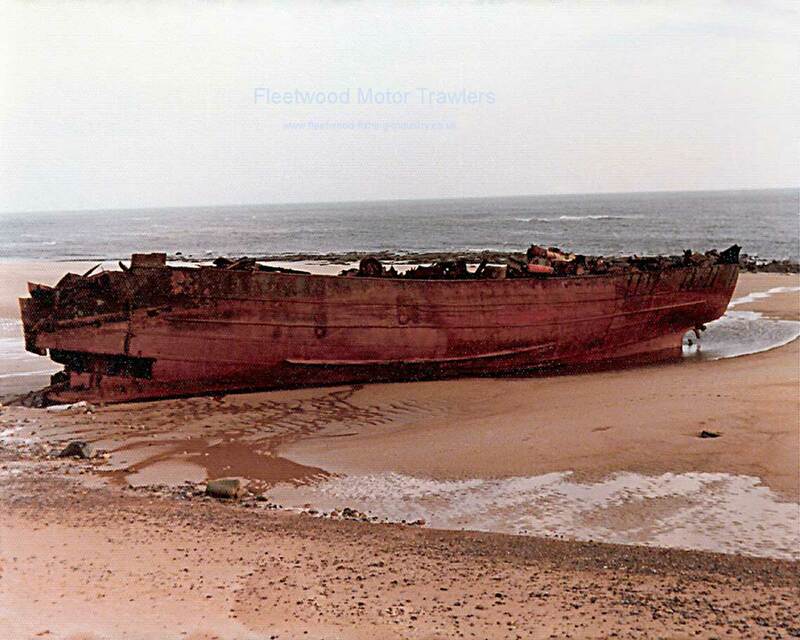 01/1999: Aground, upside down and derelict alongside Tranmere Oil Terminal, eventually destroyed by wind and tide. Nothing remained by 2001. 29/10/2016: Page re-published due to site problems. 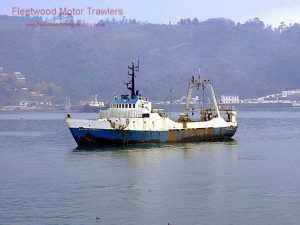 This entry was posted in Inshore Fishing Vessels, Lost, Motor Trawler on 28th October 2016 by William Brixham. 1971: Completed by R. Dunston Ltd, Hessle (Yd. No. 879) for Boston Deep Sea Fisheries Ltd, Fleetwood, As BOSTON BEVERLEY. 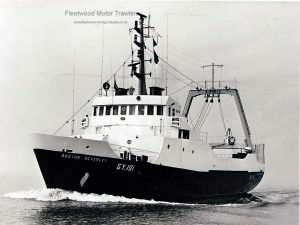 Registered at Grimsby (GY191). 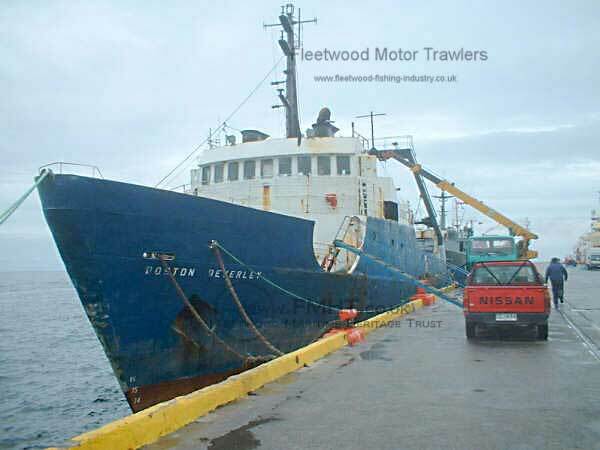 Transferred to Fleetwood with her sister ship BOSTON BLENHEIM. 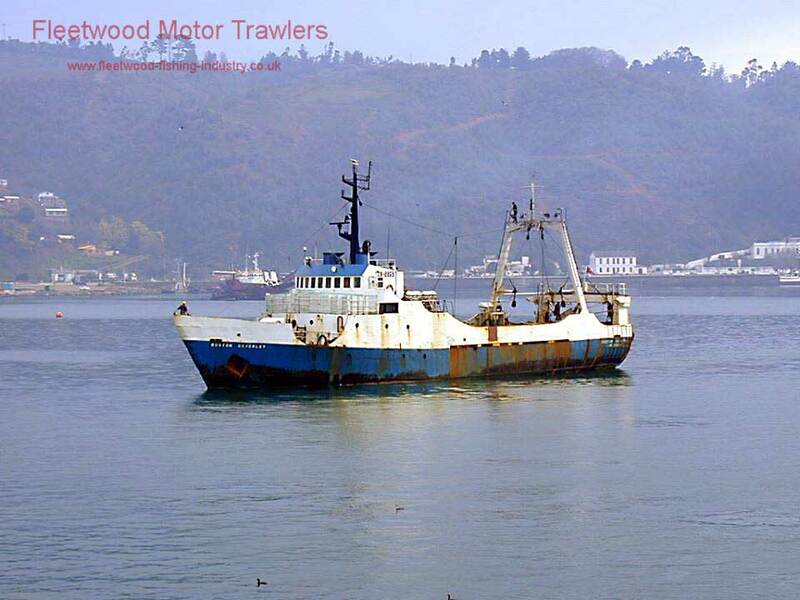 08.1979: Sold to Ben Mar Fishing Co Ltd, Chile. 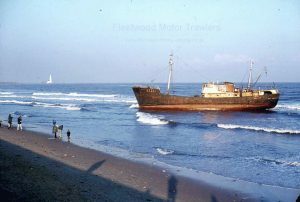 06.1982 Vessel laid up due to owners having gone into bankruptcy. Vessel later taken over by Chilean Navy. Porto Montt Southern Naval Base for Chile. 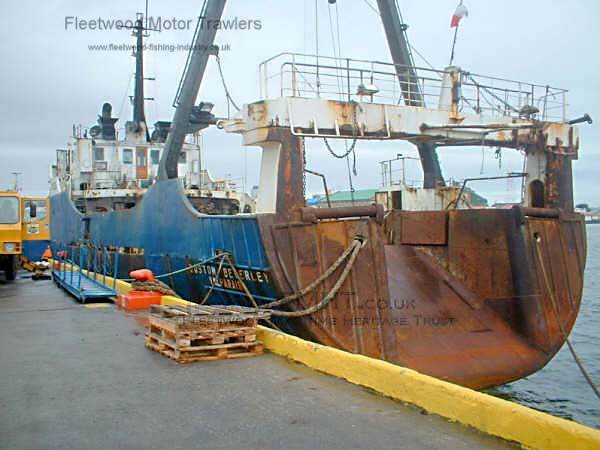 2005: Reported lost at Punta Arenas in the Magellan Straits. 22/10/2016: Page re-published due to site problems. 03/10/2017: Removed FMHT watermarks and added an image. This entry was posted in Boston Deep Sea Fisheries, Lost, Motor Trawler on 22nd October 2016 by Howard Small. Engine: Lister Blackstone type ERS6MGR3, 495bhp. Average speed on trial 10.875 knots. 1968: Launched as SPINNINGDALE (A473) for Bruce’s Stores Ltd, Aberdeen & J. Forbes, Aberdeen. 1981: Registered owner W. Forbes, Aberdeen. 1985: Registered owner Seaward Fishing Services, Aberdeen. 19?? : Sold to Robert Rawcliffe, Fleetwood and re-registered as FD29. 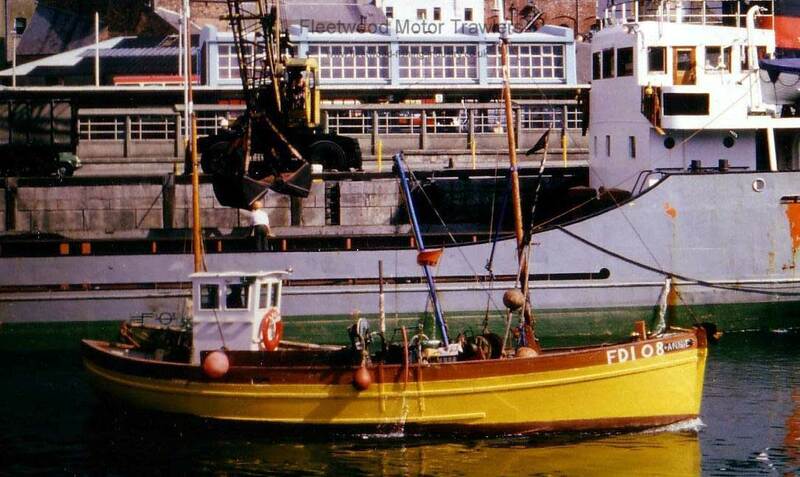 1986/7: Sold to Spanish owners and rebuilt with a full shelter deck for future long lining operations. Retained Fleetwood registration. 01/02/08: Ran aground at St. Kilda in a force 9 gale. All crew saved by helicopter. The vessel was a constructive total loss. 02/11/2017: Removed FMHT watermark and added an image. This entry was posted in Lost, Motor Trawler on 21st October 2016 by Howard Small. 9 March 1961: Sea trials, average speed 10.2 knots. 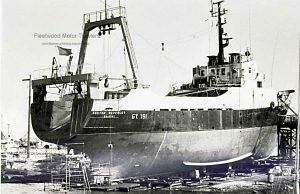 1968: Renamed VERA GRACE A581, Owner J Marr & Son Ltd, Aberdeen. 1972: Renamed NORSEMANS BRIDE K243, Owner Dave Reid. 01.1975: Ran aground on the rocks half a mile west of the North Lighthouse of Fair Isle during a gale. All crew safe. Vessel was a total loss. 330hp Lister Blackstone. Gutting Shelter. This entry was posted in Lost, Marr, Motor Trawler on 21st October 2016 by Howard Small. Converted from a sailing smack. Ran onto Pilling sands and was lost. 20/10/2016: Page re-published due to site problems. 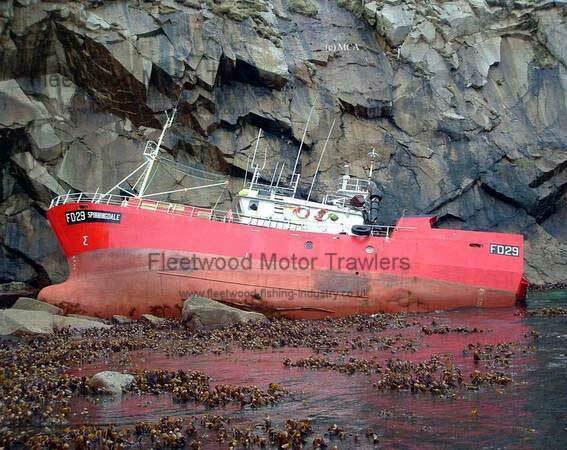 This entry was posted in Inshore Fishing Vessels, Lost, Motor Trawler on 21st October 2016 by Howard Small. ANNIE was very different in the hull shape to the regular prawners. Some time after the war she was returned to her builders (Crossfields at Arnside), for a complete rebuild. The vessels side planking was raised two planks higher, the stern was changed from the traditional low counter stern to a fine cruiser stern, like Scottish seiners. On deck the layout was the traditional, longish fore deck with the new trawl winch mounted offset to port, forward of the very stout main mast. 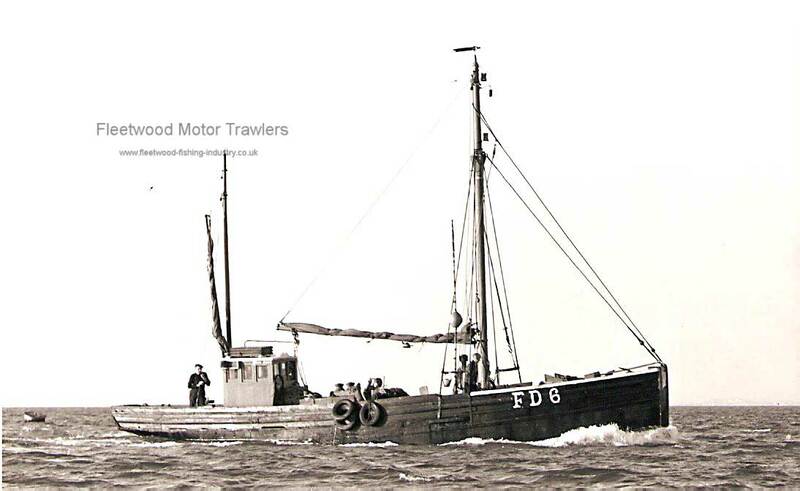 Most prawners used a capstan instead of a true double drum trawl winch, as now fitted to ANNIE. The new engine was a Lister Blackstone JP2 of 22 hp. This engine being a real marine engine, had a dry sump. The sump oil was contained in a separate tank fitted on a shelf on the port side of the engine room. Starting was by hand crank, later an electric start was fitted. The propeller shaft went out on the starboard quarter. As ANNIE had originally been built for sail, her lights burned oil, later converted to electric. The best mast head lights were reputed to be made from a Rose’s marmalade jar as it had many sides and this gave a better light. Annie was very modern compared to most of the older vessels being forty feet long, but with a little shelter doghouse just aft of the mast, above the engine. Then a long cockpit to within six feet of the stern. The trawl was worked on the port side, but when the cod end was lifted aboard with a tackle from the head of the mast, the fish were landed on to the starboard side deck. After the net was shot away again, gutting and the sorting of the fish took place with the crew standing in the cockpit, the gutted fish was sorted in to five stone baskets. 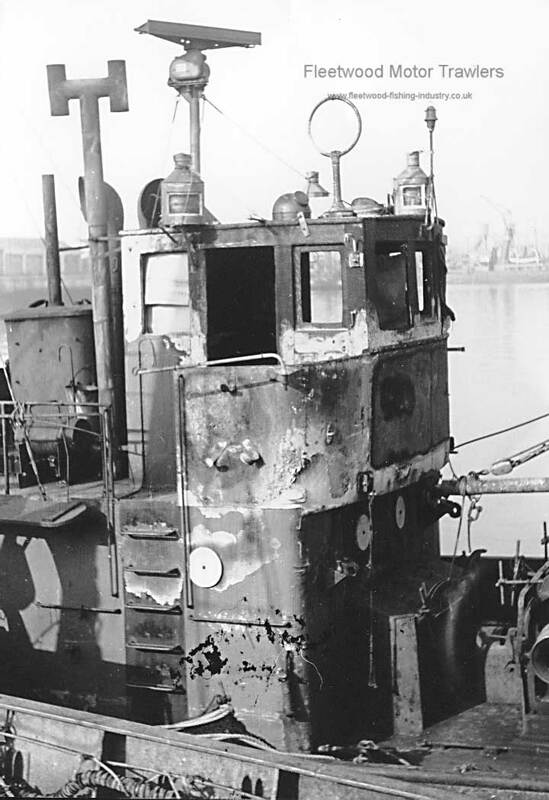 Up until 1978 ANNIE was laid in the dock at Birkenhead in a very neglected state. 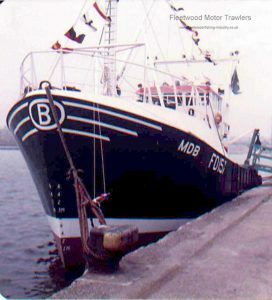 To get ANNIE from the Mersey to the Isle of Man, was a problem considering the state she was in, but a fishing vessel the ROS CARBRIE, was employed to carry a cargo of fibre-glass resin to Douglas. So Tank, her skipper, agreed to tow ANNIE for the sum of £100 cash. So my first trip on the vessel was on the end of a rope. With the ANNIE in Douglas, I was then skipper of the CAIRNGORM, work was commenced to refurbish the old boat again. The engine was fully overhauled with a new prop shaft and propeller fitted, a new wooden rudder built and fitted and the old large mast was removed and gifted to another old prawner. Two new masts were fitted, along with an after wheel house. When the work was finished the old boat looked like any other small Scotch fishing vessel. 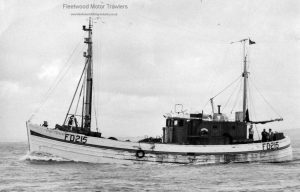 After the rebuild, she was worked trawling for fish and queenies, scalloping with two four ft. dredges. A hydraulic line hauler was fitted for long lining for dog fish. 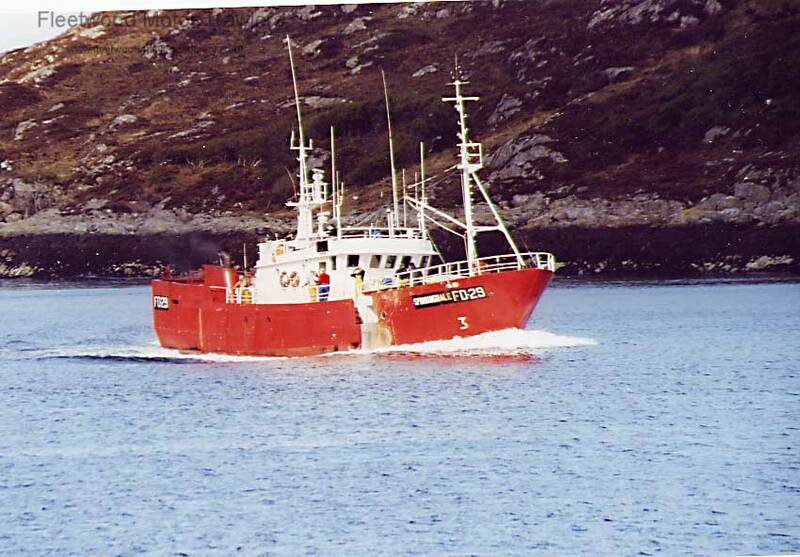 ANNIE was sold to Rathlin Island, County Antrim, N.I. After the sale I delivered ANNIE back to her old berth at Fleetwood, this was for the new owner to clear customs for the export of the boat, ANNIE was still FD 108. The old Lister engine pushed ANNIE to her new home, here she laid on a mooring as there was no harbour. In a bad storm she broke adrift and went ashore, to be smashed up on the rocky shore, when the storm was over all that the owner could find was the long iron keel. 16/10/2016: Page re-published due to site problems. This entry was posted in Inshore Fishing Vessels, Lost, Motor Trawler on 16th October 2016 by Howard Small. 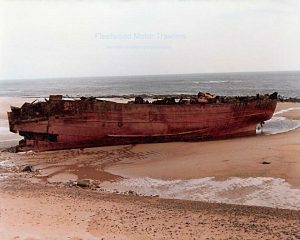 2000: Sank due to flooding from failed pipework (no casualties). 13/10/2016: Page re-published due to site problems. This entry was posted in Inshore Fishing Vessels, Lost, Motor Trawler on 13th October 2016 by Howard Small.